There are two primary communication pathways that may be employed in a given IQ System. The first type, between the computer and the system interface, is RS-232 (or RS-422). The second is called the IQ Bus. The IQ Bus a communication standard defined as the carrier of IQ command protocol on a serial data loop. That loop must be complete and unbroken from the system interface into and out of each component, returning to the interface to form a complete loop. Data on the IQ Bus is formatted for 8N1 at 38,400 baud. On twisted pair wire >12 mA is required for a logic high, <4 mA is required for a logic low. The IQ Bus normally operates on a simple two wire (shield optional) 20 mA current loop, although fiber optic cabling or other media may be used. It is important to note that the IQ Bus, although normally a current loop, does not have to be. The IQ Bus is a serial communications loop designed to transmit and receive IQ protocol. It is a communications standard, regardless of the type of wiring actually used. If a fiber optic option is used then external fiber transceivers will be necessary to make connections to the data ports of IQ System components. Operating with either the typical twisted pair or fiber optic lines, the IQ Bus is a highly flexible communication standard. Because the IQ Bus is a serial loop, the loop must remain unbroken for proper operation. A break is defined as any condition that prevents data flow coming out of the interface from returning to the interface. All IQ components which are capable of being controlled or monitored from software must be identifiable by the software. Component identification is based on the type of component, the interface loop into which the component is wired, and an eight bit address. The software on the computer can identify the type of component by a code embedded in the firmware of the unit. The loop number is determined by which IQ Bus loop the unit is physically wired into from the unit serving as interface. The address itself is set by the installer. For example, an Crown USP2 module wired into the IQ Bus on the second loop of an Crown IQ-INT II interface may have its address DIP switch set to 004. The unit is identified by the system as Loop 2 USP2 004. Loop 2 is one part, USP2 is another part, and 004 is the last part. Each IQ component has an assignable IQ address. Valid addresses in an IQ System are 1 to 250. There must be no duplications of component identification anywhere in an IQ System. For practical purposes, this means that you cannot have two of the same type of product on the same loop with the same loop address. It is legal to have two like components with the same address on different loops, however, because the overall identification of the two components would be different. For example, you could have a Loop 3 USP2 004 and a Loop 2 USP2 004. Likewise, you could also have a Loop 2 USP2 004 and a Loop 2 SLM 004. Even though the address number is the same, the type of component is different. There is no endorsement for any cable in particular. Instead, we offer you the information you need to select the cable that will best suit the needs of your installation. When you do select cable for the IQ Bus, it must be twisted pair, 26 AWG or larger, and have low capacitance. Generally, 30 pF or less per linear foot is satisfactory. Loop capacitance is the primary factor limiting maximum loop length. Cable may be shielded, however shielded twisted pair typically has higher capacitance than unshielded cable. Shielded cable should be considered if there is concern that the IQ Bus may emit noise into other sensitive cables, or where the IQ Bus is located in a high RFI environment. Never use the ground wire in a mic snake for the IQ shield or ground wire. It may be convenient to run IQ data lines along mic snakes to and from a stage, but if you must do this, then do not use the ground wire normally connected to the XLR pin 1 or you will probably get data noise in your audio. You may use wire pairs normally connected to XLR pins 2 and 3. Because mic cables tend to have high capacitance, the maximum length of the IQ Bus loop will usually be less. The maximum loop capacitance at which the IQ Bus can reasonably be expected to operate at is approximately 35 to 40 nF. It is generally recommended that you avoid exceeding 30 nF to ensure a margin of safety. Most cable carries a specification for capacitance in picofarads (pF) per linear foot (or meter). When calculating capacitance you should also allow for as much as 60 pF per IQ component on the loop. Adding 60 pF per component allows for signal degradation through the optic couplers and analog output line drivers of IQ components. To calculate capacitance start with the IQ Bus output from the unit serving as interface and determine the cable distance around the loop in feet (or meters) of wire. Multiply this distance by the capacitance rating of the wire. Add 60 pF per component on the loop. 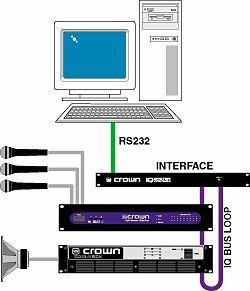 If the total capacitance exceeds 30 nF add Crown IQ-RPT Repeaters as necessary to extend the length. If a repeater is used, restart the loop capacitance calculations again from the output of the repeater. Remember that every site is different and no two IQ Systems are exactly the same. In most applications the IQ Bus may operate at distances of over 1000 feet (300 m), and sometimes over 2000 feet (600 m). The published specification on IQ Bus transmission distance is 300 to 3000 feet (100 to 1000 meters) with 1000 feet as "typical." In cases where equipment is located at great distances, fiber optic cable is often a cost effective way to get the IQ Bus to and from remote locations. Depending on the type and number of fiber transceivers, repeaters may still be required. All IQ components include a two-wire input and two-wire output port. Connector styles vary, but the internal circuitry supporting IQ Bus communication is essentially the same. At a IQ Bus input, the 20 mA current is applied to an opto-isolator circuit. This allows electrical isolation between components. To ensure isolation, connect the shield (if used) to the input only. The optically isolated input drives buffer circuitry for input to the component's processor. The rest condition (between data strings) is a current high. Because this is the expected condition, components can automatically sense a loss of input continuity and report a break in the IQ Bus. A transistor circuit is used to drive output current to the next loop component at the IQ Bus output. Electrically, a current loop exists between each output and input. Most IQ System components also include a IQ Bus drop-out relay. This relay is normally closed. When a component is not powered up, the closed relay allows the IQ Bus port to be bypassed. When the component is powered, and therefore capable of communicating, the relay is held open so that the component is in the communication loop.